This scene is so astonishing that I don’t know where to begin, so we might as well start with the caption: “Civilians walk near upright buses barricading a street, which serve as protection from snipers loyal to Syria’s President Bashar al-Assad, in Aleppo’s rebel-controlled Bustan al-Qasr neighborhood, on March 21, 2015.” The description helps, although it, too, is disorienting: What civilians? Oh, yes, those Lilliputian figures to the left and right. They are well off center for a reason, for this photograph is not about them but rather what looms over them: the towering construction blocking the view like a bizarre work of street art. Three buses–or their mechanical carcasses–have been placed on end. How did they do that? “With a crane, probably,” says the practical reader, and I’ll bet you’re right. But however it was done, it is a monument to human resourcefulness. The buses may have been ruined by warfare already, or too vulnerable to rocket attack to be used anymore, or they may have been stripped down for their new role because those in the neighborhood have learned the hard way that staying alive is more important than getting to work on time. Whatever the back story, the moral is the same: warfare demands exceptional resilience and inventiveness to survive, and people respond in kind. Which is why the scene is heartbreaking. The buses are a monument to resourcefulness, and to waste. The waste of material, of time, of productivity, of human creativity. These things are still there in Aleppo, but now they all have been taken hostage by the war. What could have been an ordinary day on an unexceptional street as people went about the business of getting on with their lives, is instead a study in interdiction, blockage, obstruction, and stasis. By not getting too close to the action, the photograph creates a space in which we can see inaction, inertness, lost lives and lost years. Buses that should move along their designated routes now prevent traffic. A street free of gunfire should be something that one can take for granted; in Aleppo, it requires a Herculean effort, and with the added cost of not being able to use the street. Instead of the unexceptional habits that can be the bedrock for a good life, this war-torn society is subject to chaos. And it seems to be a strange, gradual, grinding chaos that persists by turning the city against itself and making disorientation normal. It looks like life is merging with art, but only to hold off the viciousness and futility characterizing civil war in our time. Susan Sontag claimed that photography was surreal. What she failed to appreciate was that reality is surreal, and that photography’s supposed limitations as a medium allow it to capture how that is so. 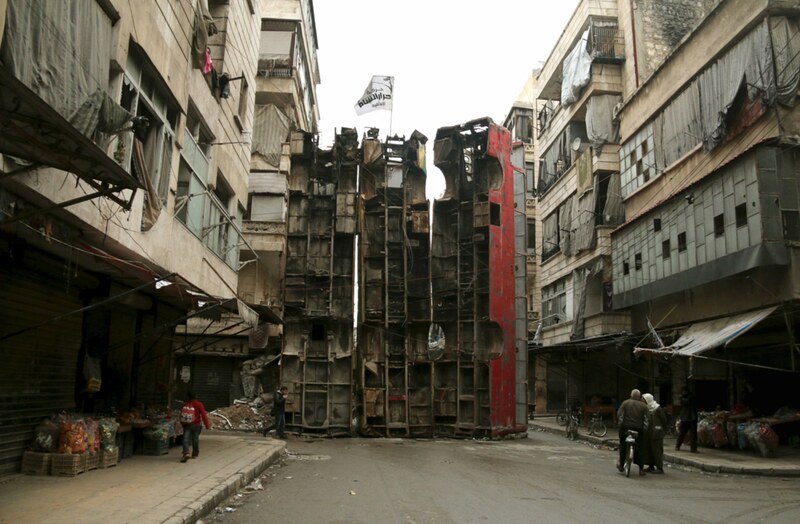 This photograph of vertical buses in Aleppo suggests a ready-made sculpture in the spirit of Duchamp. By shearing the scene of purpose which then has to be supplied by the caption, we are sure to be startled, perhaps astonished, but not too quick to rationalize what we see. The buses will block sniper fire, but still–it’s just crazy that they are the means to that end. Of course, the more sensible political, diplomatic, economic, social, or cultural means to stop the killing are not working, or not even being tried, so here we are. Waiting for peace to arrive at the Syrian bus stop. It could be a long wait. ← Previous PostCan We Photograph the Future?